Electricity generated by wind turbine technology in Iowa is robust. There are over 4135 turbines installed producing nearly 37% of the electricity for the state. New installations will soon bring the installed capacity to 40%. Contrary to the claim by a politician, there is no outbreak of cancers due to these wind turbines. Rather, the reduction of fossil fuel use has likely reduced cancers. The turbines are installed in wind farms over a broad region of the state mostly in the north and west where wind is most strong and steady. 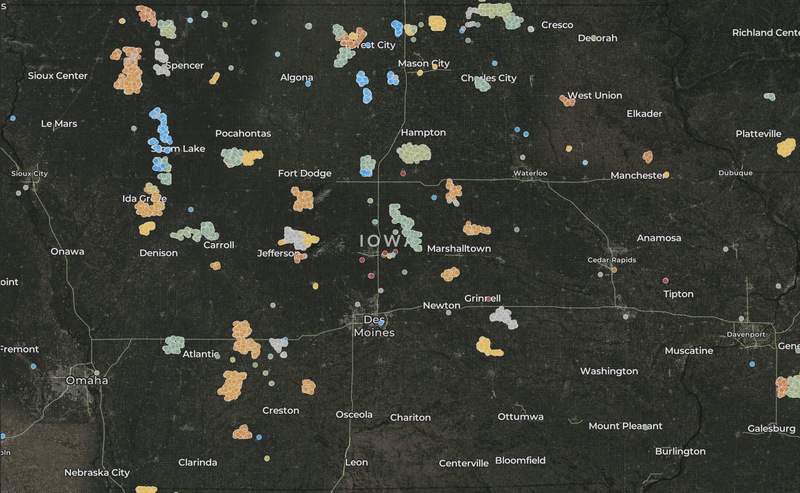 The map of Iowa turbines was captured from the U.S. Wind Turbine Database released in January 2019. The database is a collaborative effort of the U.S. Geological Survey, Lawrence Berkeley National Laboratory, and the American Wind Energy Association. Colors indicate output power of the turbine farms. The link to the interactive viewer is here. Use it to zoom in to find turbines near you if there are some. Details will appear for individual machines when you hover or click. A wealth of information about installations is available through the viewer. 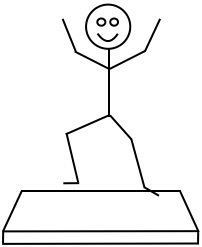 Details can be filtered using tools at the right of the viewer. This excellent 6 minute video tutorial explains how those tools work. An online link attracts you to something on YouTube. It looks interesting so you click the link. Soon the sidebar has other video suggestions for you to watch that seem related to this and other videos you’ve watched before. How are they chosen? Is someone else going to make money on your choices? Is some group trying to sway your emotional or political opinions? Smarter Every Day explores the algorithms used to make those choices and other content in the 3 large social media platforms of YouTube, Twitter, and Facebook. This 20 minute video is part 1 of 3. I think you will find it very interesting and maybe surprising. The brightest star in the night sky is Sirius in the constellation Canis Major to the lower left of Orion. It is bright in the southeast evening sky at this time of year. 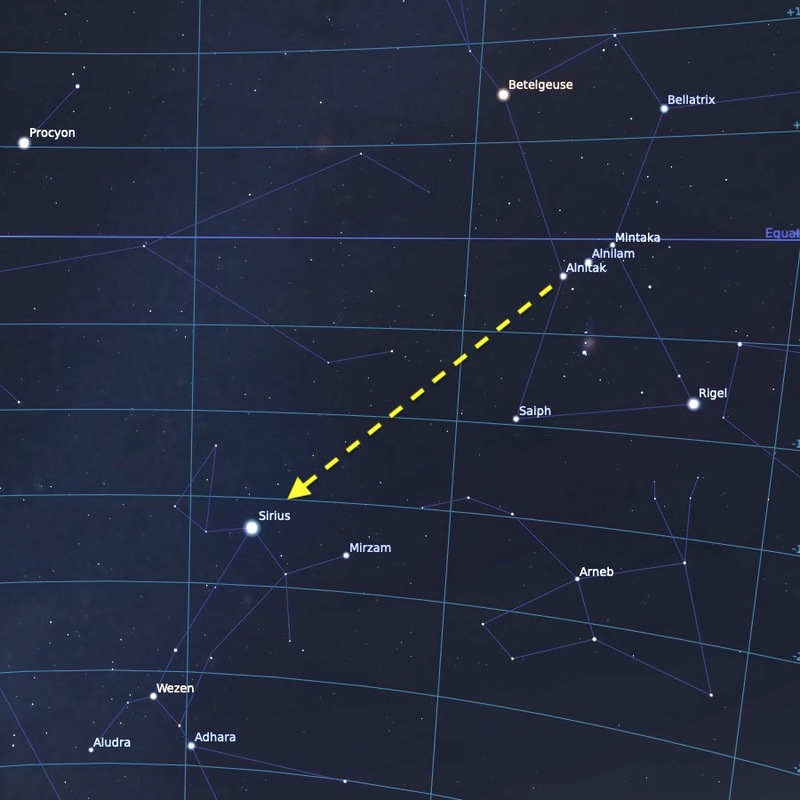 Follow the three bright stars of Orion’s belt to the lower left and find Sirius. I wondered if I could see Sirius in the daytime. On two occasions this week, I looked for Sirius with my 15x binoculars. They binoculars are heavy but steadied with my custom support. Both times I was able to see it shining brightly in bright daylight. This is a first for me. If you are interested in trying this yourself, here are some details. Sunset is just after 7:15 pm locally. The time of viewing Sirius was about 6:15 pm CDT with very clear sky. It was at 150˚ azimuth (east is 90˚ south is 180˚) and was about 26˚ altitude. I have a small app on my Android phone called Protractor that helped determine the altitude. Give it a try. The weeklong ‘snapshot’ exposure is finished. Previous solargraph posts are here. This time the largest pinhole on the can was used. That allowed more light for better contrast but it sacrificed focus. 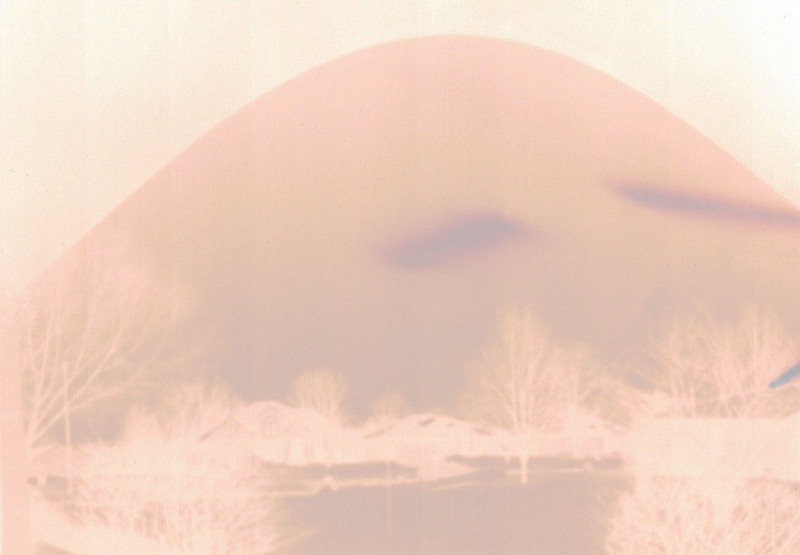 Exposure was a week instead of 4 days as with the previous solargraph. 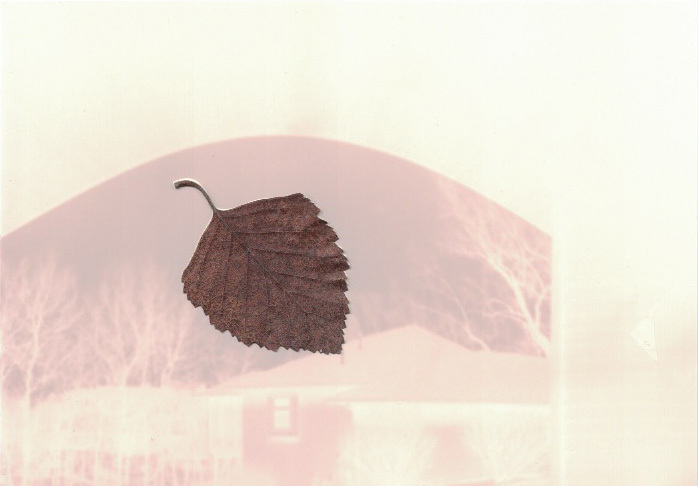 In addition, I taped a small leaf to the photopaper to see what happened. 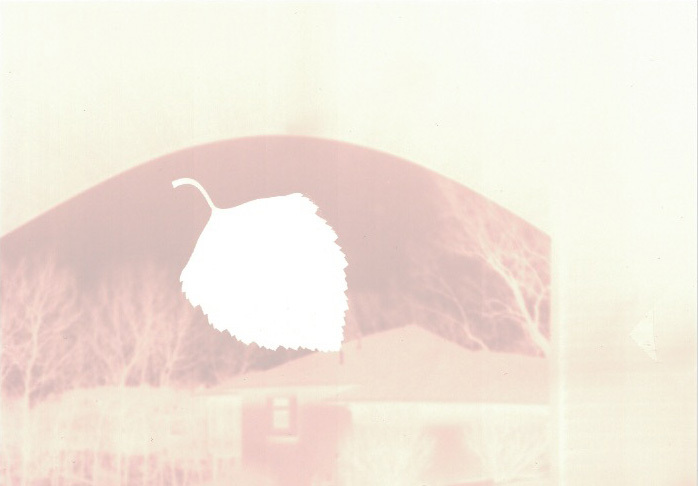 This image is a scan of the exposed photopaper from the can with the leaf still attached. 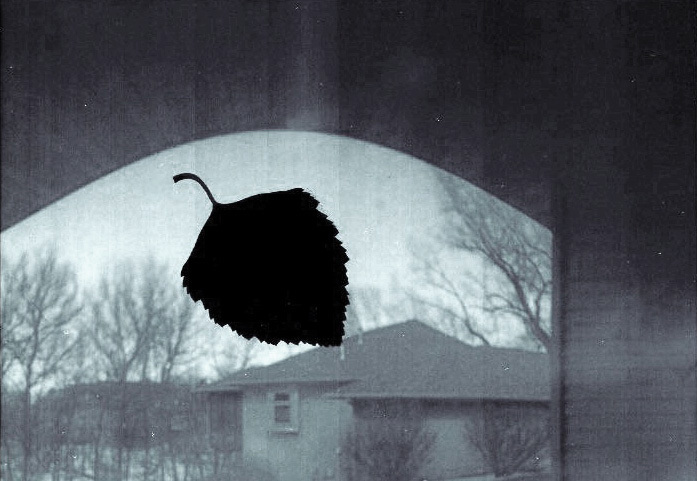 This image is another scan of the photopaper with the leaf removed to show its silhouette. Photoshop Elements was used to invert darks to lights and lights to darks for each scan. They were adjusted to be greyscale images. The siding of our house is visible at the right of the image. The overhanging roofline appears as a curved dark border just above the leaf. It appears curved due to the photopaper being curved inside the can during exposure. The images makes it look like a grey cloudy day. Actually, some of the 7 days were clear with very bright sunshine on the neighbor’s house. Edges of the shadows below the roofline are not sharp and distinct because the sun moved across the sky during exposure. I am curious which of the two greyscale images you prefer. Solargraphs 1 and 2 were described earlier in this post. The first was a 2-day exposure out the south window. The sun tracked across it. The second was a 4-day exposure out the west window. Both used the smallest pinhole aperture in my pinhole camera can. 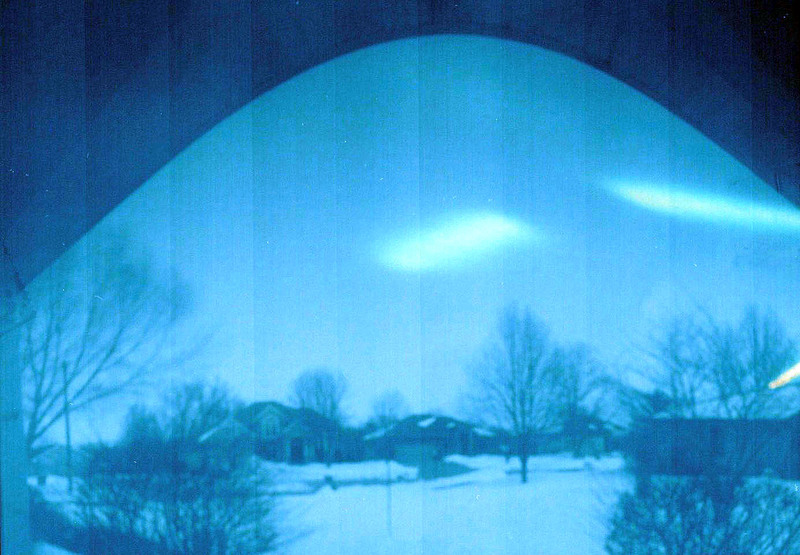 Solargraph 3 is a 4-day exposure out the east window. The view is toward our cul-de-sac circle. There is still a lot of snow on the ground. The largest pinhole was used for the aperture. It is about 2x the diameter of the smallest pinhole used for solargraphs 1 and 2. It allowed more light to reach the photopaper yielding more contrast. The larger aperture created a bit less focus. Freshly scanned photopaper with no adjustments. Photoshop Elements inverted darks to lights and lights to darks. I don’t know what caused the two bright patches in the sky portion. Maybe there was a light leak. The track of the rising sun is at the far right. Converted to a greyscale. I removed the bright patches in the sky with the software. 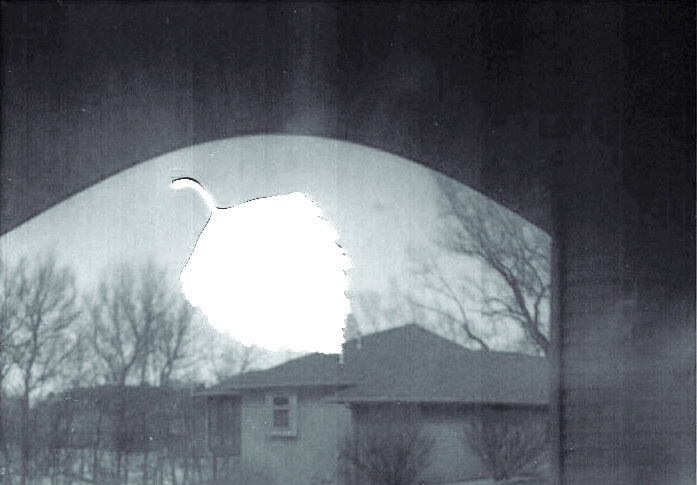 The larger aperture pinhole allowed more light to expose the photopaper. It was slightly out of focus. Now I am curious what an exposure of a week will look like. I have a north view waiting to be recorded. I’ll return after a week-long ‘snapshot’ of that view.